There may be over a billion Facebook users around the globe, but the site’s popularity doesn’t necessary make it advertiser-friendly. Sure, Facebook goes to great lengths to attract advertising dollars. That’s how they got paid before their botched IPO. But advertising success is reached through proper marketing; it’s not simply a given. To that end, it’s important to realize that there are a few key principles in Facebook marketing – cornerstones of solid advertising that allow brands to build up their reputations while padding their bottom lines. From knowing how to target Facebook ads to the proper audience to understanding how to provide engaging material, learning the fundamentals of Facebook marketing can help you succeed. A social marketing strategy is a lot different than any other type of marketing strategy. For example, if you were marketing the new bodega you just purchased, you may host some type of event like a grand opening and rely on fliers and newspaper ads to handle the brunt of the advertising. With a Facebook campaign, you’re right there with the public. You’re constantly open and able to continuously communicate. The strategy you build needs to be social in nature. A brand needs an authentic, unique voice that is consistent in tone. What exactly does your brand stand for? Figure out what your business is about and how you want the public to view it. Become this persona via Facebook and cling to your voice, adding authenticity to it through openness, honesty and consistency. Marketing isn’t only about ads. Your page is always there and always viewable, thus your brand is always available. Be authentic in your voice. When you leave any type of post or update via your Facebook page, get ready for a two-way conversation and not simply some empty post that you’ll leave alone after updating. The goal here should be to post interactive materials and to engage with your audience. You shouldn’t only be engaging when you have the opportunity either. You should be looking to start up the conversation. Dialogue is an essential element of social network advertising on Facebook. With a medium like Facebook, how do leads turn to customers and how do customers turn to repeat customers? This isn’t McDonald’s here. You’re not resting on your Dollar Menu laurels. On a site like Facebook, it takes a community atmosphere to make people feel as if they’re part of your brand. This is vital if you’re hoping to build repeat customers. Develop, build and nurture relationships in your social community. Just because a member of your community doesn’t own a business doesn’t mean that he or she doesn’t have a solid idea you can use. Always be open to learning more about how to properly market, and this includes accepting crucial feedback from your audience. If someone has a suggestion for you, take it seriously. Continue to learn and to grow in your marketing approach. 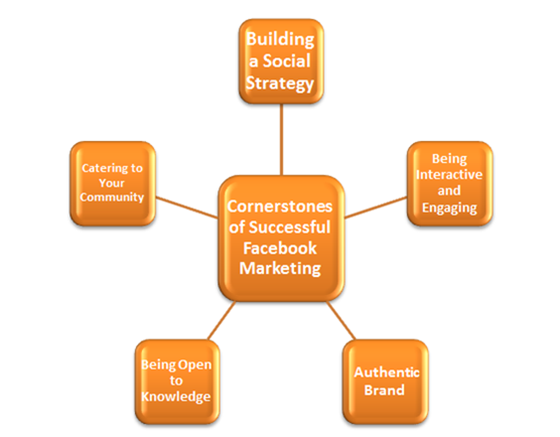 Falling back on the cornerstones of proper Facebook marketing will give you a much better chance to succeed when you develop and implement your strategy. Everyone’s marketing approach is going to differ, but these essential elements will always need to be the same. Author’s bio: Eric Taylor currently works as a freelance writer and business developer for Qwaya, a Facebook ad manager tool. The company provides extensive information, tools and up-to-date news about social media marketing trends and strategies, most specifically on Facebook. The company’s aim is to build a sophisticated tool with powerful features that are user-friendly and affordable for online advertisers and marketers world wide.